Yet again an early start on a Saturday, but on this occasion it was well worth it! Flight Sergeant (ATC) A. Street from 2425 (Nottingham Airport) Squadron was invited to go and see ‘The Royal Edinburgh Military Tattoo’ with cadets and staff from Ilkeston Squadron. The trip started early morning and took about six hours to get to Edinburgh. We all stayed at the Army Cadet Training Camp just out of Edinburgh, it was an ideal facility for cadets and staff to stay at over night. With everything ready everyone boarded the coach and was ready for a fun packed but late night event. This years Tattoo had special guests from all over Europe. 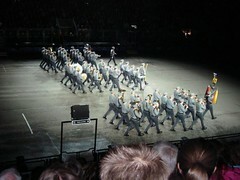 There were military bands from Germany, Holland, Brazil but to name a few. The Scottish military band was there as well of course. This year’s event was based on the Navy and had tailored the event to the life aboard the ships from past to present. The Tattoo is based right at the centre of Edinburgh castle, where the castle walls are the back drop for the spectacular event held each year and were used to project pictures to aid illustrations used within the event and made Edinburgh castle be part of this event. The different bands entertained the crowds by using different methods of drill and comical acts in their displays this made the event much more interesting and entertaining for all to see! The Marines from the Royal Navy gave a display on how they would act if a ship was taken over by pirates, the heavily armed soldiers zip lined and stormed in from the castle to arrest the pirates. There was also a cannon race between two teams of the Royal Navy they had to put together and fire off three rounds from one end to the other and then dismantle the cannon on the return. The use of pyrotechnics and fireworks within the displays was the highlight of the event using different areas of the castle to capture the atmosphere of the evening. The show lasted for about two hours in total and was jam packed from start to finish with amazing displays! It is definitely a worthwhile trip and is recommended to anyone who is interested.